Kananginak Pootoogook passed away November 24, 2010. The 2011 annual print collection includes his final six images. These images capture Kananginak’s stylistic range and great popular appeal as a graphic artist. Here he is as historian, storyteller, naturalist and even abstractionist, closing his remarkable life and career with the elegant and poignantly titled, Last Caribou (2011-08). Kananginak’s contribution to the Kinngait Studios and the community of Cape Dorset inspired the creation of a youth scholarship in his name to be awarded to a graduating high school student in Cape Dorset for academic achievement and community involvement. The scholarship was awarded for the first time this year to Daniel Manning. Kananginak was involved with drawing and printmaking since the late 1950’s when the graphic arts project first began at Cape Dorset. Kananginak’s first print, a collaborative image with his father, Pootoogook, was included in the first catalogued collection of Cape Dorset prints in 1959. Since that time, Kananginak’s work has been included in almost every annual collection, and has been interpreted in many different print media – copper engraving, stonecut, stencil, lithography and etching. Kananginak was an accomplished stonecut printmaker himself – in the early years he often proofed and editioned his own work. Kananginak and his siblings grew up in different camp areas on south Baffin Island. Their main camp was Ikirisaq where their father, Pootoogook, was the camp leader. Kananginak married Shooyoo from Cape Dorset in the mid-1950’s. They lived at Ikirisaq until 1958 when they moved to Cape Dorset because of Pootoogook’s failing health. Kananginak was a prominent community leader. He was instrumental in the formation of the West Baffin Eskimo Cooperative in 1959, and served for several years as president of its Board of Directors. He was also a member of the Royal Canadian Academy of the Arts. In 1978, four of Kananginak’s images were included in a limited edition portfolio released by the World Wildlife Commission. His work has been featured in numerous exhibitions, in both public institutions and commercial galleries. He was also a notable sculptor. In 1997, Kananginak was commissioned by the Governor General of Canada, Romeo Leblanc, to construct an inuksuq in Cape Dorset, which was then dismantled and shipped to Ottawa. Kananginak and his son Johnny were then invited to Ottawa to re-assemble the inuksuq on the grounds of Rideau Hall as part of a tribute to Native people in Canada. From the beginning, Kananginak represented Arctic wildlife in his work, often monumental in scale. He was especially capable at drawing the many species of birds that frequent the Arctic. He has also done many memorable images illustrating the material culture of the Inuit, and narrative drawings of camp and hunting scenes. In recent years he was a constant presence in the drawing studio, working on large and small scale drawings of Arctic wildlife, landscape and personal reflections. 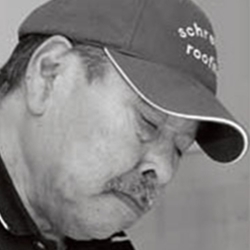 Kananginak received the National Aboriginal Achievement Award in the Arts in 2010, in recognition of his long and illustrious career.